Relief food distribution at Hadew village in Jijiga district, Somali Region (WFP, 2017). Currently, limited research exists to help understand the impacts of climate change on food security. This is in particular when expanding to questions beyond the effects of climate change on food availability (such as agricultural production), to explore broader concerns on how people’s food access, utilisation and stability over time will be impacted. Such questions require a stronger understanding of livelihood and food systems, trends in poverty and demographics, the dynamics of diets and nutrition, socio-economic and governance issues, among others. 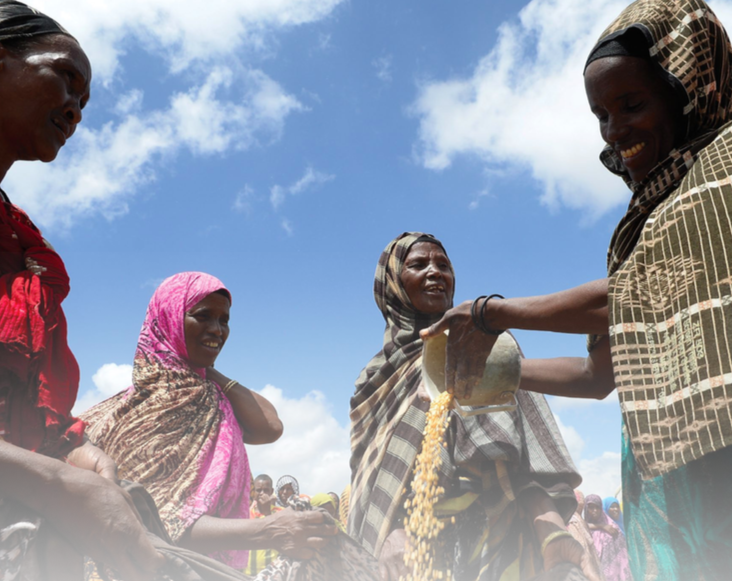 The report* provides a compendium of the main findings and lessons learnt from food security climate analyses that have been undertaken by WFP and partners under the Climate Adaptation Management and Innovation Initiative (C-ADAPT). A separate compendium of case studies, best practices and guidance on climate change adaptation for food security is being produced under the C-ADAPT Models and Standards component of the initiative. The report contains a range of food security climate analyses at the global, regional and country level. This compendium provides a summary of these findings for ease of access by policy makers, humanitarian actors and technical analysts. The full and detailed reports can be accessed by following the hyperlinks included in the compendium. This compendium is targeted at government policy makers, humanitarian partners, and technical analysts. Regional analyses include: Asia; Middle East, North Africa and Central Asia; and East Africa. Country analyses include: Afghanistan, Ethiopia, Cambodia, Kyrgyz Republic, Leo PDR, Mali, Nepal, Philippines, Senegal, Sri Lanka, South Sudan, Sudan, Tajikistan, Timor Leste and Uganda. In this compendium, food security is defined as follows: "Food security exists when all people, at all times, have physical, social and economic access to sufficient safe and nutritious food that meets their dietary needs and food preferences for an active and healthy life." Food security in this light involves four tiers of analysis: food availability, food access, food utilisation, and stability of all factors over time. Climate risk and food security analyses: This methodology consisted of two stages: (1) defining the purpose and scope of the study, and identifying data requirements and availability; and (2) a climate vulnerability analysis (including historical climatology, current climate variability, and future climate change projections), baseline vulnerability assessment, a long-term historical analysis (with climate and food security data), and a workshop with partners to validate the results. Consolidated Livelihood Exercise for Analysing Resilience (CLEAR): A defining feature of the CLEAR approach is that it takes livelihoods as the starting point: livelihood zones, rather than administrative boundaries, are used as the main analytical unit. The Shock Impact Simulation Model (SISMod): This is a modelling system to analyse the outcome of shocks (economic, market and production) on food security. The Food Insecurity and Climate Change Vulnerability Index: This index as been developed by the UK’s Met Office Hadley Centre and WFP to examine current and projected levels of countries’ vulnerability to food insecurity. Food security climate analyses can help guide adaptation planning and programme design for a wide range of stakeholders, including communities, government and international agencies by identifying priority areas that are particularly vulnerable to climate change. By highlighting how certain risks are likely to manifest, robust analysis can also help identify the most appropriate types of interventions needed. Such analyses are also important in providing hard evidence for where climate financing should be targeted. Having a variety of methodological approaches at hand encourages more flexibility in examining climate vulnerability in different settings, thus providing governments and international actors with more tailored analytical tools for their specific needs. Assessing the contribution of different climate factors to food insecurity can also be challenging, as some factors that are affected by climate are difficult to quantify but are critical to understanding food security in vulnerable settings. and livelihood assets (which are also very specific to households). Non-climatic factors are also important to accurately determine the conditions that influence food security. For example, food prices are influenced by imports and global trends, which may not always be related to climate. Climate risk and food security analyses have been particularly challenging to link to strategic programme recommendations which often requires a stronger focus on examining livelihoods (administrative boundaries are often used), their specific climate sensitivities and existing adaptive capacities. It is essential to work hand-in-hand with government and partners in both designing and carrying out these analyses, helping to build technical capacities of government counterparts for future analysis efforts. This joint work requires a more inclusive set of questions to be incorporated into the analysis exercise from the start, ensuring different information needs are more efficiently met, while also building trust in sharing data and assisting with wider buy-in with the final results. Focusing on livelihoods means the priority is placed on communities and what they do for a living. This helps understand how climate affects people, rather than geographic areas. Basic steps for undertaking a Consolidated Livelihood Exercise for Analysing Resilience (CLEAR) analysis employed throughout the report's case studies (figure 26, page 48 of the report). *For a comprehensive overview of the report's findings, please see page 47. Some of the key actions moving forward with this work include mainstreaming and building capacities in climate analysis methodologies, while also ensuring a greater focus on partnerships, and strengthening linkages of the analyses with policy and programmatic work*. While there are practical considerations such as data availability and analytical capacities that can make some methodologies more easily applicable in some settings, a key lesson learnt from climate analyses undertaken to date has been that stakeholders should define what questions they want to ask before choosing a method. Gaps in understanding the impacts of climate change on nutrition and possible solutions is leading WFP to begin to explore how to integrate a climatic lens to its nutrition assessments. Currently this involves examining opportunities with WFP’s pilot Fill the Nutrient Gap tool. Work under C-ADAPT has highlighted the importance of not working in isolation but to rather undertake climate analyses in coordination with a variety of partners. This coordinative and consultative skillset may not always be held by the technical staff carrying out an analysis, requiring leadership at a senior level to facilitate a partnership among different stakeholders. Such leadership is best applied across all the phases of climate analysis work, from defining its scope, to undertaking the actual analysis, through to validating the results. In terms of the stakeholders involved, government partners are critical to involve from the very outset to ensure the analysis’ scope will answer questions that support countries in determining their national policy and programmatic direction. This may mean engaging with a wider range of government departments, outside of normal line ministries, in order to understand their needs within and outside national climate policy processes. Involving a variety of partners from the beginning of a climate analysis project helps build ownership, capacities and trust, and should generate more positive integration of policies and programmes. Early work in C-ADAPT was found to be too dense for policy makers and humanitarian actors to easily interpret, and thus more recent analyses have attempted to generate more accessible recommendations merging from the analysis findings. Focus has also been placed towards producing more concise and visual products (including think pieces and atlases) to avoid the analyses being only used as reference documents. Partnerships with stakeholders and technical partners help to build a stronger bridge between the analyses and their application to policy interventions, including supporting governments in incorporating food security concerns into their National Adaptation Plans, Nationally Determined Contributions, and budgetary outlays for climate finance. Such engagement with these different partners can help bridge previously unidentified information gaps between government, humanitarian and development actors on the importance of addressing the climate impacts on food security. *For the comprehensive break down of lessons learnt, please go to page 51 of the report. WFP, 2017. How Climate Drives Hunger: Food Security Climate Analyses, Methodologies & Lessons 2010-2016. ​Afghanistan - Climate Change: What Does it Mean for Rural Livelihoods and Food Security? Afghanistan - Climate Change: What Does it Mean for Rural Livelihoods and Food Security? In this report, we show how drought and flood risks have changed over the past thirty years, and what impact this has had on rural livelihoods and food security in the country. In this paper, we examine the vulnerability and adaptability of women along the southern slopes of the Rumpi Hills forest, Ndian Division of Cameroon.